The FH1 adopts a hybrid design, in which the 10mm titanium diaphragm driver produces abyssal lows while the Knowles 33518 balanced armature driver provides exquisite mids and highs. 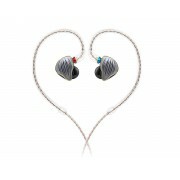 These two drivers work perfectly in harmony to allow you to truly dive into a musical, yet highly detailed experience. The latest from the renown Knowles, the 33518 balanced armature, as used in the FH1 brings both a rich, yet delicate expression of music. Theoretically, the closer the balanced armature unit is placed to the ear, the more accurate the sound is – because the ear will better receive the high of frequencies and overtones produced by the driver. However, if the tube through which sound travels through from the balanced armature to the ear is not designed properly, then even at short distances sound quality will degrade rapidly due to resonances and unwanted reflections. Therefore, to achieve the highest sound quality possible, we put the Knowles balanced armature unit inside the sound tube (to minimized its distance to the ear) made to brass (with its higher density than aluminum, it provides a more stable base with less undesirable resonances). All of this result in a natural, yet effortless sound in all parts of the sound frequency spectrum. A 10 mm titanium diaphragm dynamic driver is responsible for the FH1’s powerful lower frequencies. Due to more space being available, the FH1’s diaphragm is 25.7% larger than the F9’s 9.2mm dynamic driver, making for not only more relaxed yet natural sounding vocals but also more robust bass – resulting in a highly dynamic, authoritative experience. The FHI uses a meticulously designed crossover system so that the hybrid dynamic - balanced armature design can reproduce any frequency within the 20Hz to 40kHz range with the utmost fidelity. Essentially, the FH1’s drivers work perfectly in tune with each other that makes it ideal for a wide range of music. 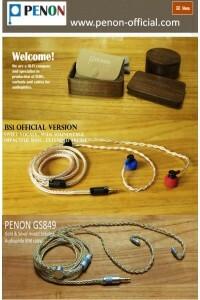 The FHI has been certified by the Japan Audio Society to be “Hi-Res Audio” capable. This means that the FHI is capable of a frequency response up to 40kHz, which can fully reproduce the audio and give you a natural and life-like listening experience that truly lets you listen to the music the way the artist wanted it to sound. The FH1 utilizes the standard MMCX connector for its interchangeable cables, and comes standard with both 2.5mm balanced and 3.5mmm single-ended cables. 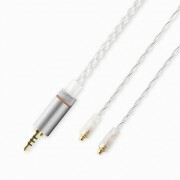 The 2.5mm balanced cable is made of silver-plated copper wire, which ensures a balanced sound signature and a high level of detail retrieval, Of course, due to its balanced nature, the left and right channel wires are separated so that there is significantly greater channel separation - leading to a richer, more detailed musical experience. The 3.5mm single-ended cable comes with a full set of in-line controls capable of playing/pausing songs, switching tracks, volume adjustment, and even calls with its high-quality microphone. 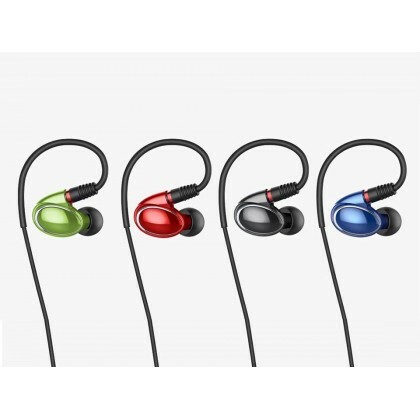 This makes the FHI a perfect complement to enhance your experience with your portable audio player or cell phone. The end of the MMCX cable’s left channel is adorned with a splash of blue, while the end of the right channel is trimmed with a touch of red - for easy identification of the audio channels in a subtly way. These channel ends also have a spiral texture engraved into them, for just the right amount of friction to greatly aid in removing and replacing the cable. The FHI’s name is derived from the French way to say “a beautiful eye” - so chosen to reflect the FH1’s oval, pupil-like design. This design is further enhanced with the presence of the chrome trim, specifically placed to recall one’s eyelids. The FH1 will surely catch your eye with its design! The shell of the FH1 is specifically nano-coated to make it scratch-resistant. When coupled with the UV-treated skin-friendly material that also makes up its shell, the FH1 is both durable and extremely comfortable to wear. The FH1’s detachable cables (both 3.5 single-ended and 2.5mm balanced) were carefully designed based on users’ feedback and their needs. 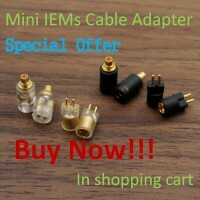 For instance, the blue and red rings at the left and right ends of MMCX cable quickly indicate to the user which is left and which is right, while the spiral grooves at the same location allow one to easily and quickly grip the cable to change it. The MMCX cable is terminated in a right-angle plug so you can quickly and safely pull the FH1 out of your audio device. After much testing and feedback from a wide variety of users, we came up with an over-the-ear design that is not only ergonomic but also comfortable. With the FH1, you can easily get Lost within your music for hours without fatigue. To be more in touch with your unique personality, the FH1 is offered in four different colors: Gunmetal Grey, Sky bule, Chinese Red, and Emerald Green. Note: Images shown is illustrative purpose only. Actual product color may vary. Besides the 2.5mm balanced and 3.5mm single-ended cables, the FH1 comes with a whole host of other accessories all designed to tailor and safeguard your listening experience. For instance, the FHI comes with two different kinds of ear tips — one set optimized for bass while the other is designed for a more balanced presentation. Each type of ear tips comes in small, medium, and large sizes. We give you control over your listening experience, so you can listen however you want, whenever you want. The FHI also comes with our popular waterproof carrying case, so you can be rest assured that your earphones will continue to function for years to come. We conduct dozens of stringent quality tests, thousands of times, so that you may cast your worries away and your fears are allayed. FiiO RC-MMCXB 2.5mm Balanced Silver-plated Earphone Replacement Cable DescriptionReplace..
FiiO FH5 Dynamic Driver + 3 Balanced Armature Hybrid MMCX HiFi IEMs Audiophile In-ear EarphoneD..